I have read all of Beth Rinyu’s books and I love every single one of them. I love how Beth can bring out so many emotions in one story. How all of her stories are so real and true to life. She creates characters that have flaws just like the rest of us. And Hope and Jamie are no exception. I have to say I was a little nervous going into this book. I knew some of what had happened and I just wasn’t sure where Beth would take this story. A Cry for Hope is a beautiful yet heart wrenching story about love, loss, grief, forgiveness and second chances. Hope had the perfect life. An amazing husband who loved and adored her and an amazing son who was her world. Until one day it was taken away from her. Hope and Jamie lost their 8 year old son Charlie in a tragic way. And from that moment on neither one of them were the same. It’s been 8 months since that horrible day and the one person that Hope should be able to count on is non-existent. Her marriage is crumbling, her husband is a complete stranger and Hope herself doesn’t know who she is any more. Hope loves her husband more than anything in this world but in order to fix her marriage she needs to fix herself first. She decides that the best thing for the two of them is to separate for a little while and give them both time to heal, in hopes that it will bring them back to each other. When Hope goes back home to live with her mother she runs into her childhood best buddy, Nick Abate. Nick is home on leave for a few weeks and Hope takes this opportunity to spend time with Nick, to make up for old times. Nick and Hope were attached at the hip when they were kids. They were the best of friends and did everything together, until Nick moved away. Nick is broken himself. Being overseas fighting for our country has damaged him in so many ways. Nick and Hope spend time together and in a way they help each other heal. Nick is there for her in so many ways and vice versa. Hope loves Nick but she also loves her husband with everything she has. Will her and Jamie be able to find their way back to each other? I loved Hope and my heart completely broke for her. She carried the guilt of her son’s death on her shoulders. In addition to losing her son she may be losing her husband as well. But she knew what she had to do to fight for her marriage. She had to heal herself first and that takes a lot of strength to do what she did. If there was any chance of her piecing her marriage back together she had to fix herself first, she had to feel whole again. I honestly wanted to hate Jamie but when all is said and done I just couldn’t. Jamie made some mistakes. A mistake that honestly I was not happy about, especially with the way that it was done. I honestly was not his biggest fan in the beginning of the book. But what really made me fall for Jamie is when Beth took us back to the past, to share those special moments with Jamie and Hope. You see how much he loved and adored his wife. How much he treasured his marriage. And you know from those past scenes that under any other circumstances Jamie would not have made those mistakes. Charlie’s death broke Jamie just as much as it did Hope. He needed someone to blame and that person was his wife. He became a shell of himself. He was lost and became someone that he wasn’t. He needed to feel numb and lower than he already did and that caused him to make some mistakes. But in the end he completely blew me away because with just one decision he proved how much he loved his wife. And for that I loved him. I have to mention Nick because he plays such an important role in this story. I loved him so much. He was an amazing friend and everything that Hope needed in that moment. With that being said for me personally, I was rooting for Jamie ad Hope to find their way back to each other. Jamie owned Hope’s heart and he was her everything. And despite his actions Jamie’s heart belonged to Hope. 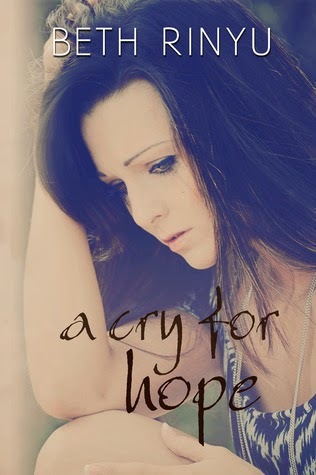 A Cry for Hope is a beautiful yet emotional story of loss, love, forgiveness and healing. When two people experience something as tragic as Jamie and Hope did it will either bring the closer together or tear them apart. And unfortunately for Jamie and Hope the latter was true. Hope and Jamie had the perfect life until part of it was taken away. They drifted apart and became strangers to each other. They both made mistakes but they owned those mistakes. Sometimes when you love someone you need to set them free and if it was meant to be they will find their way back to you. At at the time it may not feel like the right thing to do, but sometimes being separated from one another can be the best medicine needed to heal. Beth Rinyu did such an amazing job with this story. I felt all of the emotions that Hope experienced. I hurt for her and all that she had to go through. As a mother I cannot even imagine going through what Hope went through and then to not be able to find comfort in the one person that you need it from the most. I loved her moments with Nick and to see how she started to live and find herself again. At times I felt angry and frustrated with Jamie, but I also understood his pain. This story is about Hope and Jamie and their loss but I think a big part of this book is Hope's journey to healing. Beth Rinyu captured the characters emotions perfectly. You felt every ounce of pain and heartache that Hope felt. But you also experienced the happier times from the past with Jamie as well as an amazing friendship with Nick. The words were written so beautifully and in a way that you connect with these characters and feel as if you are experiencing it all with them. The ending was just perfect. This is a story that will stay with you and touch your heart. An amazing job by Ms. Rinyu! !